Around two weeks ago, Frank Forrestall demonstrated his rocket mass heater in my driveway. A freelance animator and post-production film editor, Forrestall is also homesteading in the Annapolis Valley and pursuing the ideal of sustainable self-sufficiency. 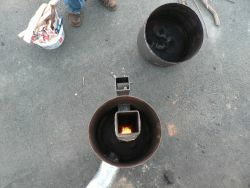 The Rocket stove is a highly efficient design with a simple concept, and even though this was Forrstall's first welding experience he was able to create a functional highly efficient wood stove. The rocket concept was invented in the 1970s by Ianto Evans, the author of the book Rocket Mass Heating. Since then it has caught on in the international development world, where its easy construction and efficiency found a home in refugee situations. The rocket's use in home heating is still taking off in North America, with Portland Or being the first municipality to legally permit a rocket mass heater for home use. I think with the continuing rising cost of heating oil and more homeowners interested in switching to wood, we will see continued interest in rocket mass heating. The secret to the design is a fierce draw: due to the insulated burn chamber and expansion of exhaust gasses, oxygen is drawn into the stove, and fuel is burned completely and at a high temperature. There is no smoke or soot, and very little ash. It also requires very little wood (as little as half a cord a year for a standard size house). Thus, the system dovetails nicely with coppicing or other sustainable ways to produce a small amount of firewood without clearcutting. Finally, the mass heater also incorporates thermal mass: a body of stone, cob, concrete or other heavy material that holds heat from the chimney, continuing to heat your house for long after the fire goes out. In May 2014 the Deanery project on the Eastern shore will be installing a rocket mass heater and you are invited to take part in the build. The date will be announced shortly. Incidentally I sell small models for cooking or hot water at Plan B.
Yours for $20 at Plan B!